Known Relatives: Professor Dradjat (father). Powers/Abilities: Able to blast fire from her fingers and to turn invisible. Extremely agile, skilled martial artist. 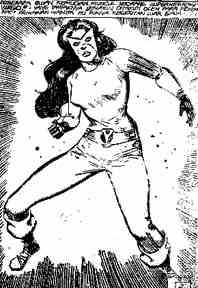 History: Inspired by Kapten Halilintar, Rini used her father's formulae and equipment (unknown of her father) to transform herself into a superpowered heroine, Virgo. Comments: Created by Jan Mintaraga.